Readers of this site – and I’m assuming you’re out there, despite the fact that I’ve purposely set it up so as to avoid managing reader feedback – may have noticed that I had proscribed a change in the methodology used to capture pinhole camera images, purposely limiting myself to one or, as it turns out, two pinhole box cameras, each capable of but one shot each. I’ve been busy practicing the one-shot ethic and am back to report on progress. Traveling some distance from home becomes an event, now that it is set in stone that the culmination of such a day trip will be one or, at most, two images. One waits for the light, waits for the setting, much more cautious and thoughtful about setting down the tripod just anywhere and tripping the shutter. The sense of excitement and anticipation I’ve always enjoyed when working with pinhole cameras, that pit-of-the-stomach tingle elicited from some deep sense of hope in the ultimate outcome of the photo-safari, seems now to be checked by a renewed sense of self-control, an inner skepticism that demands certain requirements must be met before the exposure is permitted to commence. It is no longer sufficient that I see something of photographic merit in the settings that I encounter. I now must also limit my observations to those settings that are sufficiently lit so as to permit adequate exposure, through the micro-aperture, onto slow-to-respond silver gelatin paper media. 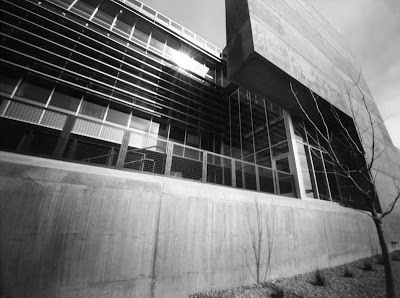 An additional limitation is now found to be the ultra-wide angle of view captured by the box camera, which demands that a dominating foreground subject be placed extremely close to the camera, while still retaining some sense of place and setting, by keeping the peripheral background yet visible. Too, as with all large cameras, there remains the necessity of keeping the shadow of the camera out of the image, which frequently means placing the camera such that the subject is side-lit. This multitude of systemic limitations works itself out in interesting ways. Certain settings and genres seem to reoccur or are tempting to revisit, once their initial worthiness has been determined experimentally. This has led to a subsequent concern that the work may become derivative and pedantic. Another observation is that there are now certain settings that will perhaps never be successfully imaged using this system, if for no other reason than the lack of adequate illumination, such as north-facing structures, or lack of close-up proximity to the subject, as when encountering fences and other boundaries. I have long wondered, as a thought experiment, whether the set of all possible photographic images is a closed set, or whether there are conditions making the answer to this question indeterminate. It now seems reasonable to state that the limitations imposed by one’s choice of equipment, media and technique make impractical the creation of images under certain circumstances. The corollary to this statement hits at the heart of what I have been seeking after through this project, which is the set of all possible images created through an imposed system of severe limitation and constraint. As I have begun to learn, only by a self-imposed process of constraint can the boundaries of one’s creativity be expanded; this is, on the surface, painfully paradoxical – yet absolutely, fundamentally true, both personally and, in a larger sense, universal.